First off, may I just say how excited I am to be sewing with you all? What an honor to be on board at CPHQ and chatting with such a lively and happy blog audience! Now that we are all acquainted, I have a confession to make: I am an impulse fabric shopper. If I see a 50% off tag on a fold of coral and brown plaid wool at the Pendleton Woolen Mill, it’ll probably end up walking out of the store with me (even if it is the first eighty degree day of the year). For this reason, I usually start new sewing projects searching out a pattern to go with fabric I already own. But in the case of Sew-alongs, where you have committed yourself to a pattern first, you’ve got to find the right fabric to compliment the design. To keep myself on track at the fabric store in this situation I like to figure out exactly what I am going to purchase before I start browsing the bolts. 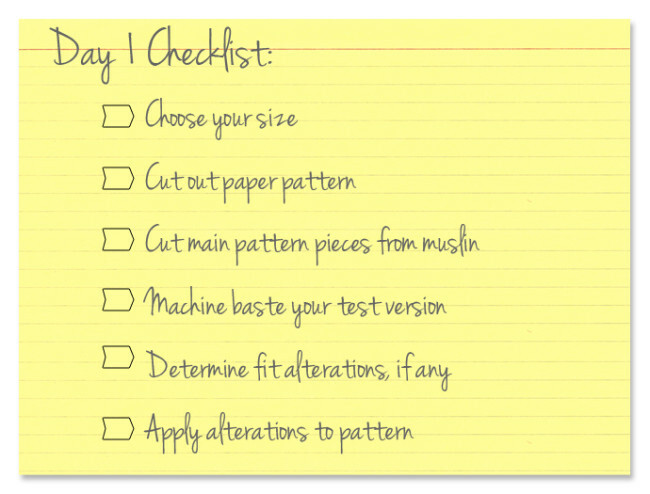 The easiest place to begin is the suggested fabrics list on your pattern. For the Hawthorn you’ll see the following list: cotton shirting, linen, voile, lawn, cotton poplin, seersucker, chambray, cotton flannelette, madras. If you’re like me, that list still gives way too much leeway to wander the isles of my local fabric store. I try to narrow my options further by identifying the key design elements of my project and considering how different fabrics will compliment them. Here is my list of things to look at on Hawthorn: Sleeves, structure, and grainline. Sleeves: If you’re going for version three, think about how a chambray will lighten them and give a summery feel while a cotton flannelette will create more of a transitional piece you can layer with sweaters. If you choose the sleeveless style, you’ll probably want a light linen, voile or lawn to create a light and effortless summer dress. Structure: The collar and faced button-up closure require fabrics with a bit of structure. A sheer silk would result in a floppy collar and might look a bit wilted, losing the crisp clean quality we like in the menswear style of shirt dresses. Semi-circle skirt and peplum: The drape of a bias cut will give the perfect breezy summer feel if you use fabric with a nice drape. We shy away from stiff quilting cottons for this reason. Of course, these are the same design elements the patternmaker considered when compiling the suggested fabrics list, but I have an easier time picking one specific type of fabric from the list when I understand why it was included as an option. Everything on the Hawthorn list is lightweight and will lend itself beautifully to the grainline of the skirt/peplum as well as the sleeve length and neckline. Some final things to consider might be: What shoes will I wear with this garment? Is there a specific occasion I want to wear it for? What colors will compliment me and make me want to wear the garment often? Do I have time to tackle a difficult pattern like plaid, or should I use a simple solid? I have pondered these questions and safely made it out of the fabric store with just one cut of fabric! I’ll be sewing version two, but with version one sleeves. I picked a red and white striped seersucker, which will look great cut on the bias for the sleeve finish. Tip: When working with seersucker, make sure to wash and dry your fabric, then give it a thorough ironing to press out the wrinkles that form naturally due to the weave. If you don’t iron before cutting, the wrinkles will release as you sew and press your garment together, adding lots of excess width. 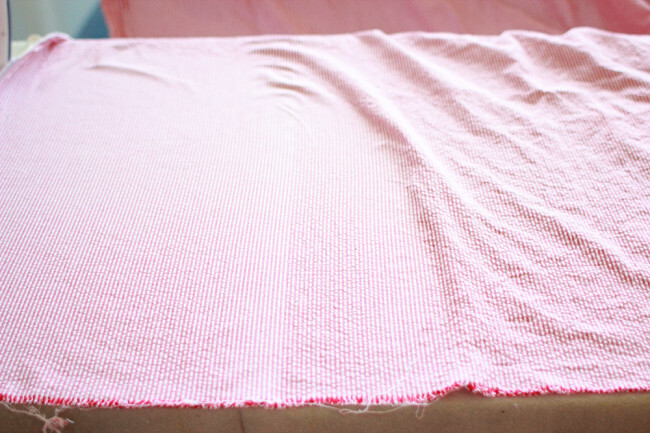 Below: Left side of fabric has been pressed, right side has not. Sarai has picked a navy cotton silk blend by Marc Jacobs with brass buttons. Now we can talk muslins. You may know of a few pattern alterations you want to make, but if not, a well constructed muslin is the best way to spot any glaring fit issues. Here are the innards of the muslin we created to fit our model. While it isn’t necessary for you to go so far as adding button holes and buttons (you can simply pin your muslin closed) you do want to put enough care into your construction to make the process worth your while. I have rushed on muslin constructions in the past and ended up missing some key fit issues, which defeats the purpose of the muslin. Also, the more care you put into your muslin construction the better practice you get for your final garment. I like to think of this as a dress rehearsal where I can get all of my mistakes out and then cut and sew my fashion fabric without a hitch. Alrighty, on to our checklist for today! Take a look at the measurement chart on your pattern booklet and locate the best size for you, focusing on the bust and waist measurements. The hip is open, so that measurement is not as important. Unless you’re making a wearable muslin (a garment you think will fit well enough to actually wear) there is no need to cut out the facings. Just cut the bodice front and back, skirt front and back and sleeves. Lay out pieces as shown in the cutting layout diagram. Transfer all markings (dart legs, button holes, fold lines, etc) then cut pieces. 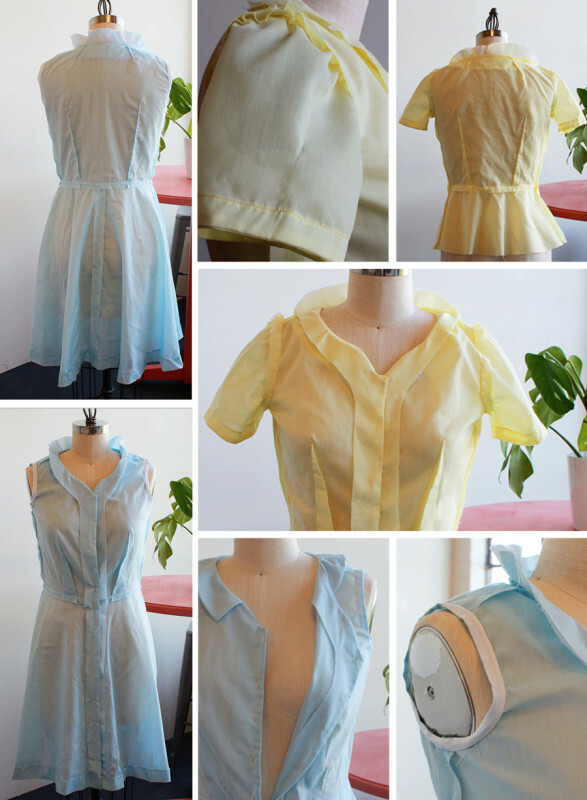 Here is a picture of all the pieces I cut for my wearable muslin. I decided to cut the facings, but I am not going to interface them. A good pressing before wearing will give enough structure without making the dress stiff or overly formal. Sew shoulder and side seams of bodice. Stitch skirt back (J) pieces, then attach skirt front (I) pieces. Sew three rows of basting between small dots on the top curve of the sleeves. Pull the bobbin threads to lightly gather the fabric. Sew underarm seam on sleeve, then set sleeve into armhole. Attach cuffs to determine the fit of the width and length of your sleeves. Since we did not attach the facing, we will need to turn the center front seams under by ¼” to remove the seam allowance. If you were to try and fit the muslin at this point without turning the center seam under, you would end up with an extra ½” of width all around, and this might lead you to think that the pattern is too large. Put on your muslin and lap the right side over the left side by 1/2″ placing pins on buttonhole markings. Is the waist fitted yet comfortable, without any pulling at the waistline? Do you like where the waist seam hits your natural waistline and the length of the skirt? If not, you may want to lengthen or shorten the bodice, or lengthen or shorten the skirt pieces. These only require simple slash alterations on the lines indicated on the pattern pieces. 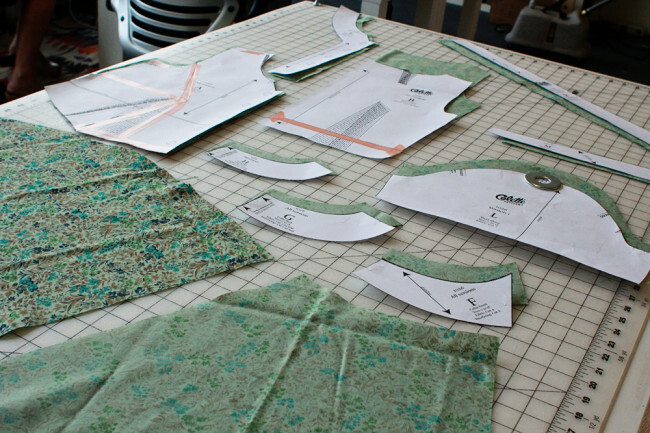 Add or remove any width or length to the pattern pieces. We will have detailed tutorials next week on Full and Small Bust Adjustments, as well as Wide and Narrow Shoulder Adjustments. Have you picked your Hawthorn fabric yet? Tell us what you’re using and why you picked it for your version! Rachel is a nerdy Oregon native with a philosophy degree and classical dance background. She fancies her personal style to be quirky sophistication, focusing on the importance of fit while adding special touches of handmade embellishments. She is also a connoisseur of whiskey and nap-taker extraordinaire. The white seersucker dress sold me on the pattern. I plan on the second version with the short sleeve. I am considering of altering the short sleeve to be gather and lengthening the shirt. I am so excited!!!! Oh I mean lengthening the skirt. I’m probably going to do mine in basic poly-cotton because I have a ton of it lying around the house. I picked a tie dye cotton lawn in blue and brown. I’ve had it bookmarked forever and have been waiting for just the right pattern to use. You just reminded me that I don’t have any shoes to match it. Now I have to go wander the shoe stores aimlessly and come home with everything that’s on sale. I picked up this fabric @mood in LA, I have no idea on the fabric content or designer though, but it’s similar in weight to chambray so I should be fine. I do need to go pick up some muslin though! I should just bite the bullet and buy a bolt, I’m always running out. That print is beautiful! I like making muslins out of old sheets or thrifted cotton fabric since you can find them for pretty cheep. Terrific, I am happy to help! Hi Rachel! Huge congrats on your fantastic new job! So great to see you appear on Coletterie! :) I have so many versions of this dress dancing around in my head as I love the shape so much but am thinking of starting with a solid pale blue linen version and a yellow gingham one; both sleeveless for summer! Think I’ll be adding a lining to both and possibly making a new slip to wear with the yellow as well as it’s pretty sheer fabric! I added a lining to the skirt. I’ve just cut the same pieces but 1 inch shorter . I cut them just the same and then I’ve basted 1 inch from the bottom to have a line to cut. I prepared the lining as the skirt and hemmed it. Then I sewed the lining to the skirt on the waist and front, assembled the dress and treat skirt and lining as one for the rest of the process. I should be posting some pictures about it soon. Sarai and Rachel, what kind of fabric is the polka dot used on the shirt sample? I love it and I have been trying to source out something similar, with no luck… Thank you! It’s just a plain woven cotton shirting. Try searching for shirting fabrics at some of your favorite sites! I am also making the dress, with the short sleeves, and for that I bought a gorgeous royal blue Swiss dot. I am so excited about making this dress! I have already planned several versions ;-) can’t wait for my pattern to get here to start tracing. Oh, fantastic, thank you, Neemie!!!! Eek! I’m still waiting on my pattern to arrive in the mail, but I’m super excited about it. I have so many ideas for patterns to go with this fabric, I can’t make up my mind! I’m leaning towards a solid linen/cotton blend. I can picture the finished dress with details of tatted lace at the collar and sleeve, wish would probably take forever for me to actually execute. I want to make version 2, with pockets added. Because everything is better with pockets. Oh wow, tatted lace would certainly make a lovely addition. My great grandmother tried to teach me how to do that when I was young but I could never get the hang of it (I was only 10). Watching her weaving the shuttle with such ease is still one of my fondest memories. Learning to tat was my DH’s 35th birthday present to me. I can’t remember a time when I didn’t want to know how to tat. It took me a long time to find someone who knew how and could teach me. One of my favorite projects was making a tatted insertion for my little girl’s dress… 90″ long and about 2″ wide. It was lovely! 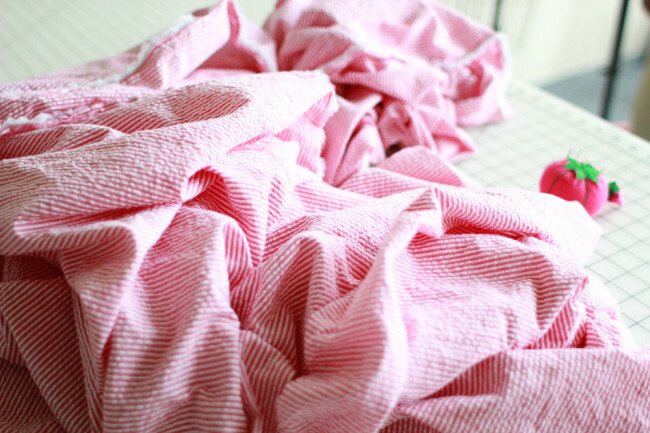 I did a wearable muslin with pink madras that I bought on sale. I had made a size 10 for the bust, but it was tight so I altered. Can’t decide whether to switch to the 12 for the real version…. If it fit in the waist, you can do a Full Bust Adjustment. We will have a tutorial for that on Monday! Thinking about doing version 1 but perhaps sleeveless. Looking into using a super wax fabric bold geometric print. This is EXACTLY what I plan to do, too! Hey Rachel!! So excited to be participating in the sew-along!!! :) I was browsing for fabric the other day, and I considered getting a seersucker as well. However, I’ve always had this question about the fabric, and maybe you can help – how important is it to line up the stripes of the seersucker when making a garment? I would imagine that it it’s not that difficult to line the stripes at the shoulder seam, but other than that, where else would it be reasonable to match up the stripes? Same thing about gingham…? Is it reasonable to try and match the plaids everywhere on the garment when using gingham? I can’t wait to get started!! Thanks so much for all the great tips in your post!! With pattern matching I find it’s a “ya win some, ya lose some” situation. It’s difficult to get every single seam to match, so I decide which intersections are most important for the particular garment. Generally, I like my bodice and skirt to match up for dresses, as well as my center seams. If the pattern is bold I’ll try to match the side seams as well since it’s a bit easier than small pinstripes, etc. Thanks for any and all help you can offer!! I know this sew-along will be great!!! I see quite a lot of these dresses in my future! A few months back I bought a beautiful silk/cotton blend that is light, fluid and has the most delicate yellow flower pattern. I had no idea what I would sew with this fabric until I saw the Hawthorne! I can not wait, the muslin is going together today! Oh my goodness, Sarai’s is going to be so cool. Those buttons! Hello, Rachel! *waves* I love your stripey seersucker!! Fantastic! What a great post!! I have my fabric and my pattern arrived yesterday. Time to get to work! I bought a navy and white seersucker with small skulls and crossbones embroidered on it. I think the edginess of the crossbones with the dainty lines of the seersucker will be a fun combination. I’m making the sleeveless version because I like to wear cardigans over everything. I can’t wait to get started! I am so excited.. Today I will be scouring the fabric stores trying to find just the right fabric for my pattern. Been checking several online fabric stores and found some beautiful dotted swiss to create version 2 at http://www.lowpricefabric.com but am worried about the time it takes to arrive at my door. Hoping my pattern makes it to my mailbox soon. Can’t wait to work on my muslin. Must have “word’ dyslexia today.. Swiss dotted.. Geezzz.. I love this pattern, and have plans for all three versions. I’m not usually a peplum fan, but I want to make the blouse in some lovely mustard and grey print cotton lawn. I’m starting with version 2 but with short sleeves using a beautiful floral print cotton lawn. My daughter wants me to make one for her too, she hasn’t chosen a fabric yet. I had my heart set on seersucker the minute I saw the dress. I’ve chosen blue and white, and I’m going with the sleeveless version. Would using a twill fabric be a possibility for this pattern? Or would I run into problems with the skirt? It depends on the twill. Twill refers to the weave of the fabric, and there are so many types of twill, from lightweight silk twills to very heavy cotton twills! You’ll want to use a fabric that is not too heavy. Thanks for the response! It’s a lightweight, cotton twill with a slight crinkle that seems to be heat set or within the structure since the crinkle stayed even after I washed and dried the fabric. I guess I just wasn’t sure if the twill structure would be a problem when placed on the bias? On the bias it seems to be more stretchy in one direction than the other-will I need to keep this in mind or will it not really matter? The bias only comes into play at the side seams of the skirt. If it’s stretchier along one bias line than another, you may want to make sure that the side seams are cut so that the two bias grainlines form a V at each side seam. This should help keep them even. I am going to use some light green cotton from my stash. 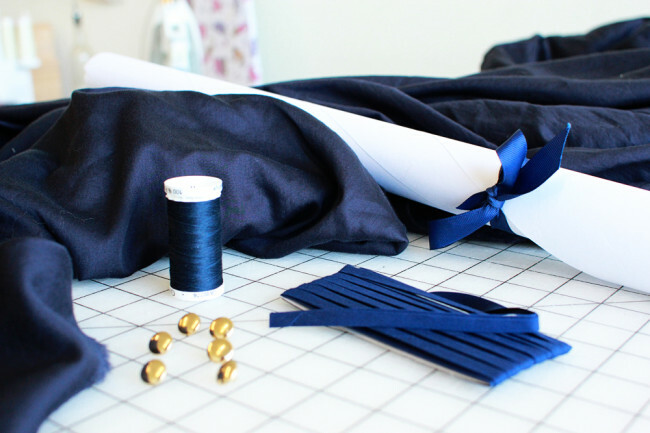 I tend to buy what I like at the fabric store and figure things out later – but since I also tend to decide on making a garment at 3 in the morning, this all tends to work out. I do think this is a beautiful pattern and I am very excited about this sew-along. I’m waiting for my pattern to arrive so I have time for fabric hunting. I’m planning on making version 3. 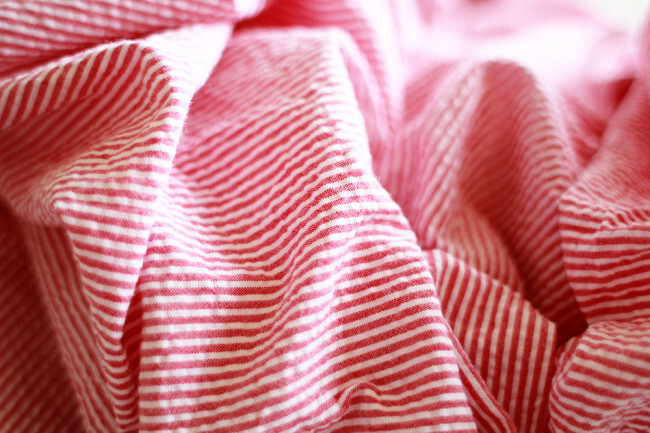 I’m envisioning my version in wide-striped linen I recently saw in my local fabric store. Do you think that will look ok on a bias-cut skirt? I’m planning on the long-sleeved version, as I doubt I’ll finish before Fall. I’m trying to decide on a fabric that will have a touch of warmth to it (Not too much, as I live in Houston and it doesn’t really get cold except indoors). Maybe a cotton sateen? pique? Love that dress, can’t wait to see yours!! I’m not participating in the SAL, since I’ve got too much else in process, but I’m planning on making this dress once I’ve cleared through my WIP. I’m definitely going with seersucker for my version. 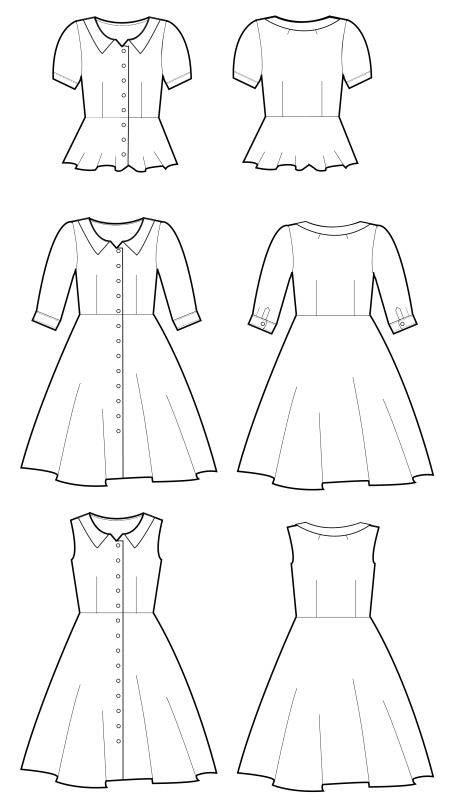 I’m doing the dress, with the short sleeves of the blouse. I made a Version 2 with sleeves from Version 1. I made it in a Liberty Lawn that feels so great against my skin. It has an art deco like design with flowers, little dots, etc. that goes in horizontal stripes and I didn’t plan on the pattern making a chevron design at the sides. I did the best I could but wasn’t able to totally match it but I’m hoping that since the skirt moves around a bunch it won’t be noticeable. The dress was MUCH easier than I thought it would be and the bodice goes together like the Violet blouse. I need to do the buttonholes and buttons and finish the sleeves and hem, but it will be ready for the weekend. I love it and can’t wait to start another. Yay, go Colleen! You’re fast! When you wrote about trying on the muslin for fit you wrote, “Put on your muslin and lap the right side over the left side by 1/4″…”. That sure does not seem like enough overlap. Is there a typo? You’re right, I’ll edit. Should be 1/2 inch (the center of the buttonhole marks the CF). I made version 3, and did use quilting weight cotton, and while the skirt is not so drapey, the dress is just so dang cute. I just love your idea of using a different fabric for each section…. Looking forward to your photos! Same here, it will be fabulous! I’m going to use a rayon print I already have in my stash. I know rayon can be very drapey (is that a word?) but I plan to underline the bodice part w/ a plain lightweight cotton. I am making one out of a cotton fabric I’ve had for a while. Hopefully there’s enough! But I’d love to make one out of silk satin, something light and feminine. I’m making mine from a lightweight cotton gingham that feels like a voile that I bought from Gertie’s etsy. It’s mint green and matches a ton of my accessories (hair flowers, purses, etc. ), so this will make for a great outfit. I’m making this as a dress for swing dancing, so I’m going with the sleeveless version to better enable uninhibited arm movement. Also, as much as I like sleeves, I think going sleeveless modernizes the dress and print a bit- if one isn’t careful, a gingham shirtdress can turn out looking very sisterwifey, if you catch my drift. I’m already pushing it with the faux mother-of-pearl buttons that I plan on using with it. Ooooo….I loved that fabric. It will be perfect for this pattern! I am sooooo exited about this sew along! But I cant seem to decide on what fabric to use! I just received my pattern and am going to trace/adjust today. I can’t decide which of my fabrics to use – have a gorgeous indigo chambray in linen and cotton that I think would look great but I think it would be better in 3/4 sleeves – plus I have 3.25 m…… so I am thinking of making a wearable muslin in a liberty lawn I am not that crazy about….ah, the perils of buying online! One sort of tip – since I started sewing again a couple of years ago, my rabric prepr was limited to giving my fabric a gentle machine wash at 30 – way I’d wash it after. REcently, I read how cotton and linen can keep on shrinking, and was talking to one of the longstanding haberdasheries I use – where they were shocked at this. No no no you have to soak fabric at least overnight! I then remembered my expert aunt B used to do that – according to her it eliminates any future shrinkage. So I am doing that again now – and washing at the end of the soak….. Even before I finally ordered the pattern ( a whole 5 days after it was released, lol) I had ordered a linen fron Fabric Mart to make it in. As a new sewer, I really appreciate the fabric suggestions. I am not planning to do the sew along, but I am planning to make this before vacation next week. And as far as shoe shopping, I don’t know if there is anybody on this blog from Bowling Green Ky. But there is an awesome shoe store called Hyders here. The shoes are new and around $10 to $40 depending on the brand. They are new shoes, not first quality. Rachel if its not ok for me to have posted this, feel free to delete my comment. Both fabric choices are terrific, and I’d love to see what the “wearable muslin” will look like (the fabric looks great!). I’m not sewing along, sadly (too many other projects and UFO’s around), but if Imay say, I’m SO looking forward to the tutorial or lesson on making a Small Bust Adjustment. This is a term I’ve only heard recently – here, of course *lol* – and I’m really looking forward to learning about this. being not so blessed in this area might be part of the reason I’m so hesitant in my eventual dream of sewing most of my wardrobe. I selected a purple/grey and white 1/4″ pinstripe linen I’ve had my eye on for some time. I’ve sewn the fabric in a different colorway for some marcy tilton pants. While lightweight and cool, the fabric does have structure. One question as I have not sewn your patterns … just to clarify – the bust measurement is upper bust, correct? What cup size do you draft for? Thank you! I’ve just started with this and noticed that the darts were a bit low for my shape, has anybody had the same? I just did my muslin and found the same thing. It’s a relieve knowing that I’m not the only one. For me it worked raising the darts 2 cm. I’d love to know what solution you found. This is the first time I have used one of your patterns. What cup size is the pattern drafted for? Please correct me if I’m wrong, but I think it’s either a B or C cup used in the drafting…? It is drafted for a C cup, but fits without adjustment on a D as well. Can’t wait to get started, I am so tempted by polka dots! Great article. I just bought my first pattern the other day so this is real helpful! Still waiting for my pattern to arrive. Hopefully it comes soon so I can sew along or summer might take over! Since Rachel advocated thrifted sheets, I might do my muslin w Sesame Street sheets before I spend lots of $ for the real deal. Do you think this would work ok?? Do you think it would look funny if I used this as the main fabric, and a cream for the color/cuffs for version 3? I think that could be really lovely, and might help break up the business of the print. I chose a floral cotton lawn as modelled by my plush bear on my blog. I’m going to make this as easy as possible for myself! I have such a beef with muslins though and I hate the term ‘wearable muslin’ since I personally think you’re either making a muslin or not making one. Despite my beef with muslins, i’ll make one… i’m feeling the peer pressure! I found my fabric. (I had nothing in my stash with enough yardage!) I’m considering it a wearable muslin, mostly because the fabric is so inexpensive ($3/yd!) that if it doesn’t turn out, I won’t feel like I wasted too much on fabric. It’s a floral print – giant poppies (red/rose) on a field of light blue (which is barely seen). The poppies have large yellow centers, so I bought some yellow buttons, and I’m considering playing with yellow piping. It’s a poly-cotton gauze (I guess – the weave is fairly large), a bit scratchy, so I may want a lining (cotton bastite in white or blue most likely). And I’m not sure if I want to try the sleeves or not on this version. If I do piping (on the collar and maybe the edge of the button placket), I may want to try tulip sleeves with the same piping. Or I could just used yellow exposed bias tape on the sleeveless version. I love your fabric choice! Very excited to be following along. I am hoping to use this fabric, it does say it can be used for dressmaking but I was wondering if it might be too heavy? Hi Janice, I hope you don’t mind me chiming in, but I think the fabric is far too heavy. 250 gsm is extremely heavy fabric, even if it was suitable for dressmaking I don’t think it’s good for this dress. It’s a more appropriate weight, and much cheaper! It’s handkerchief linen, so it is sheer and crisp, but much lighter than that upholstery weight linen. I believe I saw some linen with tiny roses and doves scattered on it at Ebay the other day, if you feel like searching there. It was even cheaper than the Fabric Mart stuff, if I remember correctly. Oh thank you that was very helpful! I didn’t realize that linen came in so many different weights! I will definitely check that out. I think I’m intimidated by making a lining but really it is time for me to learn…and like most things in sewing I’m sure it’s not nearly as hard as I’m imagining. I think with semi-sheer fabric and this simple pattern, especially if it’s for casual wear, a regular full slip or even cotton shift type slip would be good enough. At least, that’s what I’m hoping, ’cause my cotton voile is pretty sheer, too. I got some red chambray (cotton/linen) during Hancock Fabric’s 50% off sale today. It’s washed but not pressed. I have to finish making my Lily dress first. Hello, I was wondering if any one could tell me which pages of the pdf (version 3) to print if I just wanted to reprint the bodice front and back. I wanted to try it in a smaller size with a full bust adjustment. I was just thinking about the same thing, so decided to go ahead and figure it out. The two pieces are closest together in version 1, so print these pages from that one: 1 and 2, and 4 – 15. Piece 3 is the middle of the sleeve and though you don’t need it, you might want to print it for ease of print set-up and/or alignment when you are taping. Is anyone planning to line their Hawthorn? I’m planning to line the skirt with batiste. I thought about lining the bodice too but I’m finally not doing it. I am underlining with a silky rayon since I’m using an eyelet fabric. I’ve been away on a vacation for the past week, so I’m just starting. Hope I get all caught up. I’m planning on version 3 using an eyelet cotton and underlining with a silky rayon. Will that end up being too heavy for the drapey skirt? I don’t think it will, personally. Eyelet has such a lovely stiffness to it that I think it could really look great. If you’re worried about the heaviness, one thing you might consider is staying the waist seam (with twill tape or seam tape or even grosgain ribbon) to keep it from stretching out. I think I’m really going to love this dress once it comes together. I have this lovely pattern, but I find the neckline just isn’t working for me. The neckline is too wide or too low, maybe both. How can I adjust this so I’ll be comfortable wearing this? Thank you! I haven’t worked up this pattern for my dd yet, but I suspect you may want a narrow shoulder adjustment. You might also want to simply redraw your neckline to be narrower & higher. I will probably be doing this for my dd, too. Teresa, thank you for your help. I thought of drawing the neckline higher, but I’m afraid I’ll mess up the placement of the collar. Sigh. I’ve done V neckline adjustments before, but they have been non-buttoned V necks, with no collars. I have a feeling I’m going to learn a lot. :) Thanks, again. and red grosgrain trim on the white. Sort of a sailor dress take. I’m not sure what to do about buttons though. I think anchor shaped buttons will be too much. So, I’m not sure what color plain buttons to use … red, white, or blue? We bought it locally here in Portland. Check out all the lovely Chambrays at Hart’s Fabric! I need some help, please. this will be my first time trying to sew a dress. I picked a lovely seersucker fabric for this dress, but now I am stuck. My measurements are for a size 12 on the bust, and a size 16 on waist. Which size pattern should I trace? I am now thinking maybe I should do a size 14? I am definitely going to sew a muslin, but I really don’t know where to start. I read that I should taper from the smallest to the biggest size, I just don’t know where to taper on the bodice. And what about the sleeves? What about your shoulders? Are they narrow like your bust? (Or even moreso, like mine!) Or are they closer to a 16 like your waist? If the latter, you should cut a 16 and do a narrow bust adjustment. If the former, go with your shoulders (or maybe a 14), then use a curve to go from one size to the next along the side seam. Or try using the darts – either don’t take in as much at the end of the dart legs, slash them open wider when you cut your fabric, or both. The skirt can be cut a straight size that agrees with whatever the final measurement is. Donna, thank you very much for your suggestions. My shoulders are narrow, along the lines of my breasts, so I will follow your suggestion on size 12, and then graduating to the size 14, and then use the darts. I really appreciate you taking the time to offer a suggestion to me. I’m making Version 1 – I’ve picked up a grey linen (with a little viscose, which gives it a nice hint of sheen). I’m planning on embroidering the collar, cuffs and buttons – I just have to pick the right colour! Again, thanks for any help! I decided to use up some of my stash and the ful skirt of Hawthorne made this print look like fun! It’s a lightweight cotton lawn with little camping characters on it. I love white so i figure I’ll wear a slip underneath version 3! I’m going to make a regular muslin for the bodice since I almost never fit patterns precisely to my measurements- broad shoulders and long torso. I’m thinking the final version will be a textured grey linen. Or a textured cotton with a vibrant print. But the cotton has stretch… would that be okay? I be made my muslin but the arm holes and across my back seem enormous, whilst the waist is too tight. Not sure how to adjust this…am new to all this! I’m new to all this, too. I just started seriously sewing in November and while I’ve been pretty busy these past months (3 jackets, 3 pants, shorts, a blouse, and a bag), I’m just now trying to adjust a standard blouse pattern to fit me (the other blouse was from Lekala, which prints a custom pattern for the measurements you give). After putting together muslins for two Colette patterns, I decided I need more guidance and just purchased Fit for Real People. It hasn’t arrived yet, so I can’t personally review it, but all the people who seem like they know what they’re talking about recommended. If you’re facing a confusing array of potential adjustments and don’t know where to start, maybe you could get a copy, too.